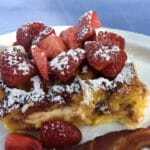 Strawberries and Cream French Toast Squares is a lovely breakfast or brunch dish for a special occasion. Make most of it ahead of time and prepare your table and the rest of your meal while it bakes. Cut into squares and place on a pretty plate, dust with powdered sugar and serve with sausage or bacon on the side. Warm maple syrup is optional, since this French toast is sweet enough on its own. 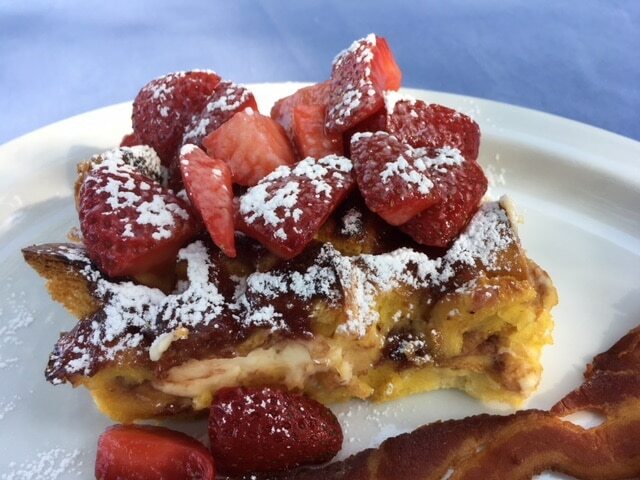 When you read through the recipe for Strawberries and Cream French Toast Squares, you can see that most of this is easy to make ahead. Then just put it together the next day and bake it. The berries can be made the day before and kept in the refrigerator. The casserole can also be put together and refrigerated. Try this with other fruits–peaches, blueberries or blackberries! Right now it’s fresh peach season, so the next time I make this, I’m going to use fresh peaches and peach jam instead of strawberries. For those lucky enough to live in a place where blueberry jam is readily available, this would also be good with fresh blueberries and blueberry jam, or blackberries and blackberry jam. This recipe is a lot like another French toast casserole we’ve been making for many years, Blueberry French Toast Squares. The fruit jam gives it even more of the fresh fruit flavor, and in this version, the bread cubes on the top are slightly crispier. Food is always part of the travel adventure in New Mexico! Stay with us at the Bottger Mansion of Old Town, a historic bed and breakfast in Albuquerque, NM. You never know what will be on the menu. We aim for a wonderful breakfast you can’t get anywhere else. Try our house-blend juice of the day, and enjoy a bowl of fresh fruit topped with house-made sorbet. We provide comfortable rooms, outstanding amenities,and friendly hospitality, along with a warm, delicious breakfast in the morning that will help get your day started. Explore the many attractions of Albuquerque or simply relax in the peace and quiet of our inn. Our beautiful haven in New Mexico is waiting for you, so check our availability and book your stay today! Make the macerated strawberries: Place strawberries, sugar and lemon juice in a large bowl and stir well until combined and the berries are evenly coated. Cover and refrigerate at least 30 minutes or up to overnight. Place a rack in the middle of the oven and heat the oven to 350 F degrees. Spread the bread cubes in a single layer on a rimmed baking sheet Toast until dry and very lightly golden-brown, about 10 minutes. Set aside to cool slightly. Coat a 9 x 13 inch or 3-quart baking dish with cooking spray. Add half of the bread to the baking dish and spread into an even layer. Arrange the cubes of cream cheese evenly over the layer of bread. Using a small spoon, dollop half of the jam evenly over the bread. Arrange the remaining bread in an even layer over the jam. Place the eggs, half-and-half, sugar, vanilla and salt in a large bowl and whisk until fully combined. Pour evenly over the bread, then gently press down with your hands to make sure all of the bread gets saturated. Dollop the remaining jam evenly over the top of the casserole. Cover the baking dish and refrigerate for at least 1 hour or up to overnight. When ready to bake, arrange a rack in the middle of the oven and heat to 350 F degrees. Remove the baking dish from the refrigerator and let it sit while the oven is heating. Uncover and bake until the casserole is set, puffed, and the top is golden brown, 40 to 45 minutes. Set aside to cool for at least 5 minutes. Right before serving, stir the macerated strawberries and evenly spoon over the top of the casserole. Dust with powdered sugar and serve warm.